First Holy Communion is preceded by First Confession, and the full titles of these two Sacraments are the Sacrament of the Eucharist and the Sacrament of Penance and Reconciliation. These two Sacraments will normally be received by children in Year 2 or 3 and, to register, parents need to complete an enrolment form. This can be printed from the PDF below or picked-up from the Parish Office. 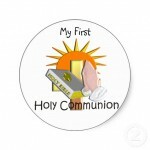 Prior to receiving their First Holy Communion, children will make their First Confession. Guidance will have been given, and the Sacrament takes place towards the end of the Season of Advent in the Parish Reconciliation Service, when a number of priests will be available. At Our Lady and St Anne’s church, so that the church does not become over-crowded, First Holy Communions may be spread over two or more consecutive Sundays, all at the 10.00am Mass.